Introductury literature to start studying or even for the first exams, should be found in the textbook collection in the left area of the reading room on the ground floor. 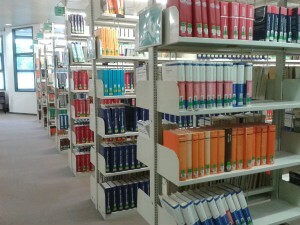 The books are in alphabetical order of the subject groups.The first shelf block begins with Agricultural Sciences (AG), in the middle block can be found Mathematics (MA) and Mechanical Engineering (MS), on the window side rear follow for example Process Technology (VT) and Materials Sciences (WK). 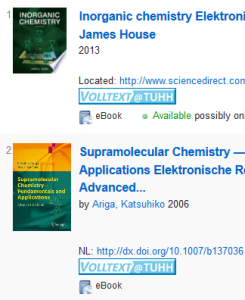 Sometimes an electronic edition is available, in every case there is for every textbook title at least one archive copy (reference copy). It may not be borrowed, and therefore it is available for everybody during the opening hours . The first time you visite our library you will surely notice this shelf in the entrance area. 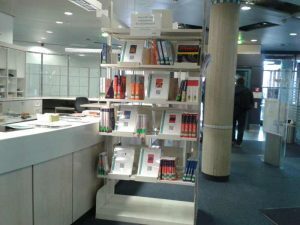 Our shelf for first-semester offers a selection of books, especially for those who start studying – from the textbook to the collection of formulas. Further copies of these books can be found in the textbook collection. And also: if these books from the shelf for first-semester are available electronically, the QR-code on the reference panels contains the corresponding link. So: please access to the intranet and scan the QR-code. Please search for your studies in our shelf for first-semester, welcome! Anyone here who wants to take a look in a chemistry textbokk from 1819? 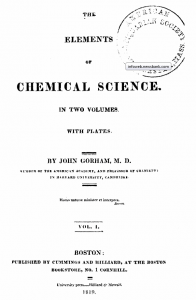 The elements of chemical science Gorham, John. Boston : Cummings and Hilliard, 1819.